We love our pasta in this family, we do. For a variety of reasons, one of which is that pasta lends itself to being concocted in the briefest of time frames and using whatever ingredients are there to be sourced, easily within reach in the fridge or in the store cupboard. Woe betide us otherwise … It has to be said, fortunately, that woe has not had cause to betide us ever! Not … that is … until last Saturday when I realised that our home was woefully bereft of any pasta! (Signature dramatic music and rolling of the drums !) Gob-smacked and reeling from the shock (it was past one o’clock) …. what to do, what do to?????. A packet of Carnaroli rice stood to attention in the store cupboard. Noblesse oblige. 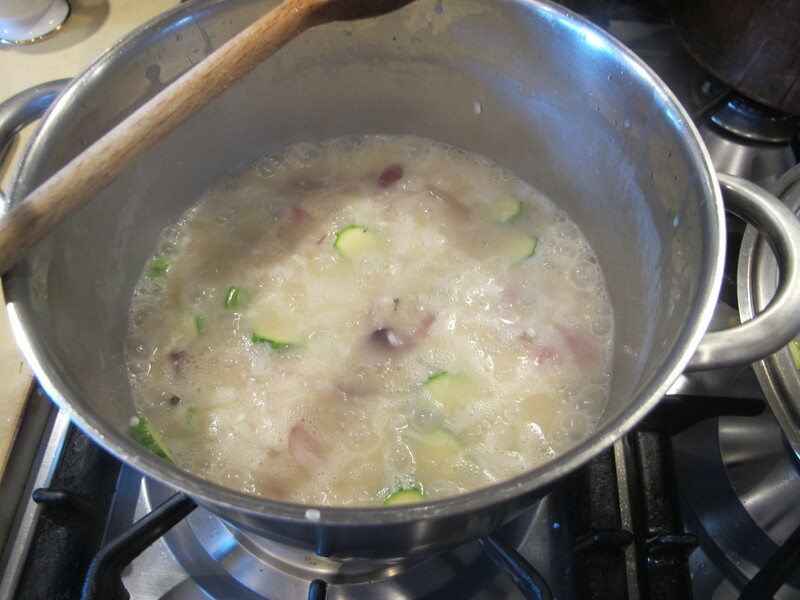 And that is how this strange recipe came about … instead of making a ‘normal’ Carbonara (i.e. using pasta), I ended up making a Carbonara risotto. 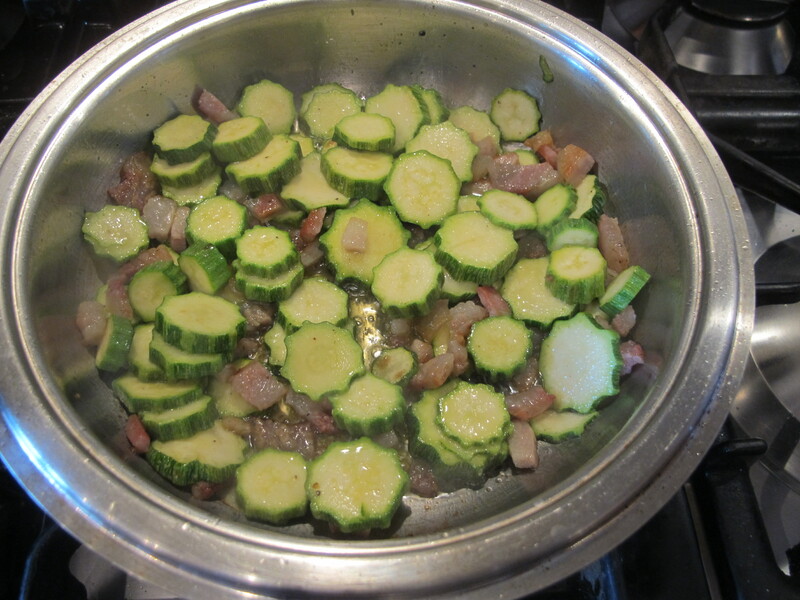 And, hey!, in for a penny, in for a pound … there were a few courgettes lurking about so I added them too. What is a girl to do? Sigh. Shame faced but artfully camouflaging the fact, I infused my voice with a tone of glee as I announced to the usual suspects, my oft forebearing family members, that they were going to be delighted by a ‘new’ dish today. I began by toasting the rice the usual way, and adding some chopped up onion, and adding half the guanciale to the mix … and then boiling water. I didn’t have time to make a vegetable stock. 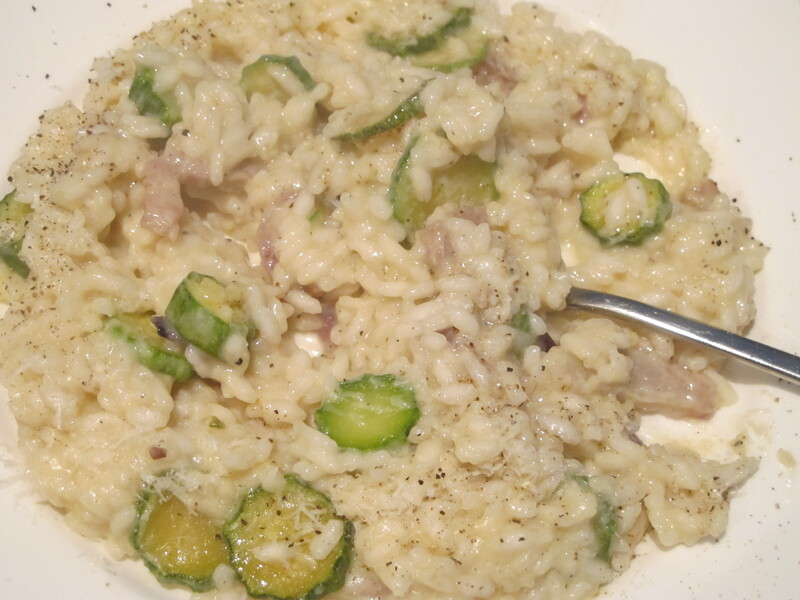 While the risotto was cooking merrily away … I cooked the guanciale until it was almost crispy and then added some sliced courgettes. 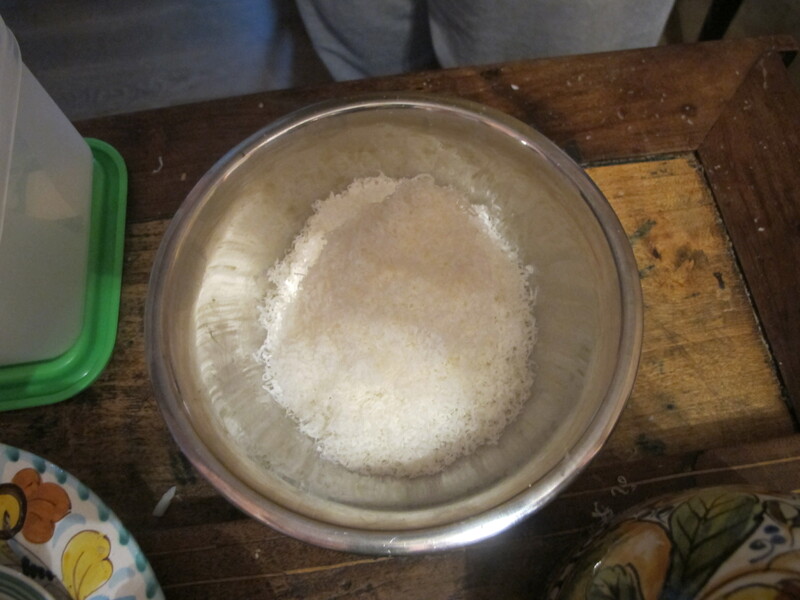 Two egg yolks straight from the fridge … Some grated pecorino cheese (pecorino romano) …. 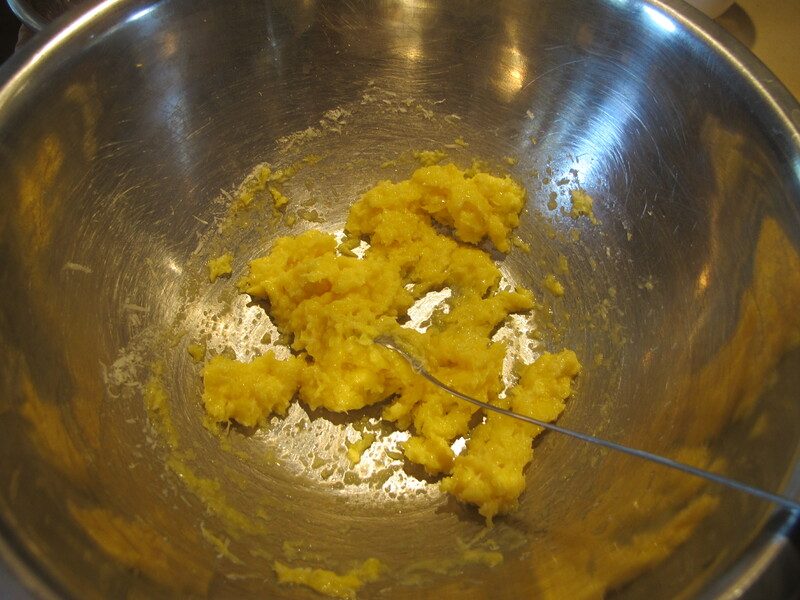 I mixed the egg yolks and the pecorino and made a thick paste (a ‘roux’). 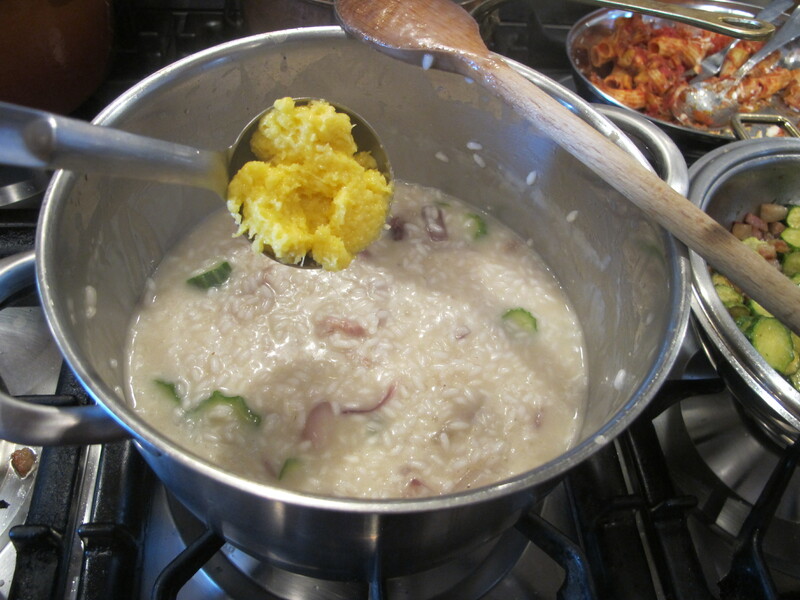 When the risotto was cooked, I switched off the heat and added this egg and cheese paste. 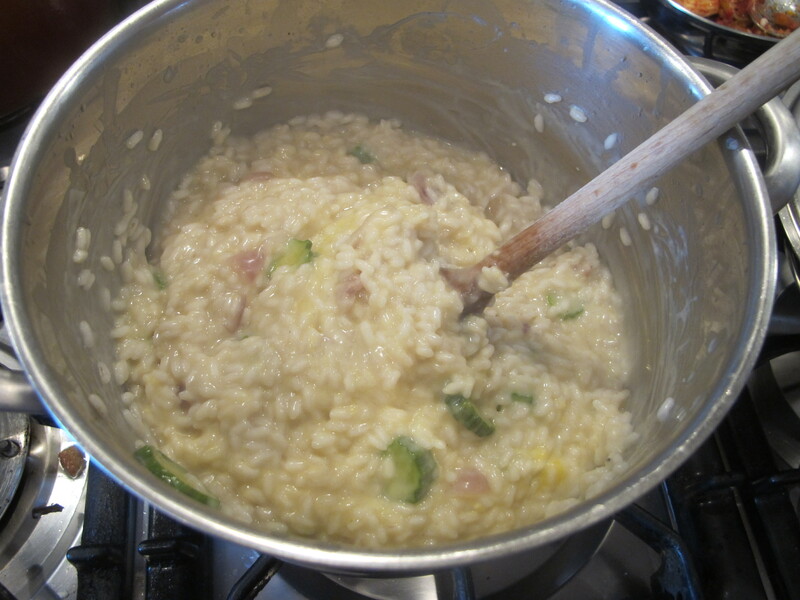 I used a wooden spoon to combine it and create creaminess in the risotto …. 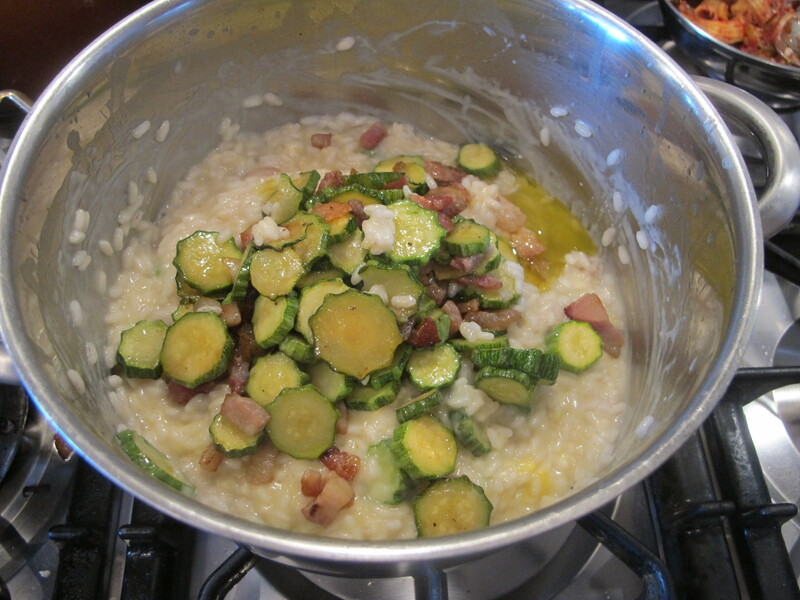 And then added the courgettes and guanciale that I had cooked separately. On the plate with lashings of freshly grated pepper for me …. Would I make it again … sure, why not? Guanciale, pancetta and sausage make anything taste better anyway. Presentation could definitely benefit from a little more care but … can I tell you? We were all starving and there just wasn’t time for that. A good appetite has a way of setting priorities in proper order. Crotchety people are very often hungry people. 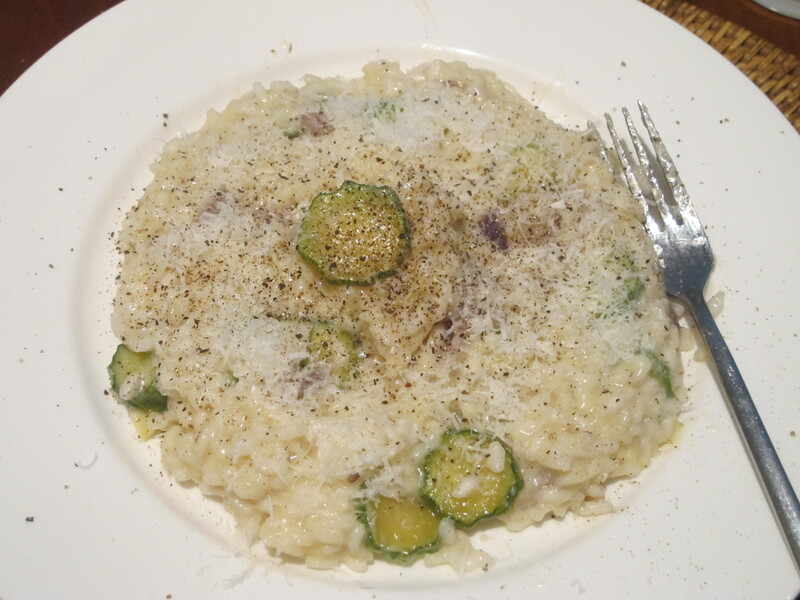 This entry was posted in italian home food, Primi (first courses - usually a pasta or risotto), Risotto and tagged carnaroli rice, courgettes, evoo, guanciale, onions, pecorino romano, salt and pepper. Bookmark the permalink. I know I would be delighted with your “new” dish. 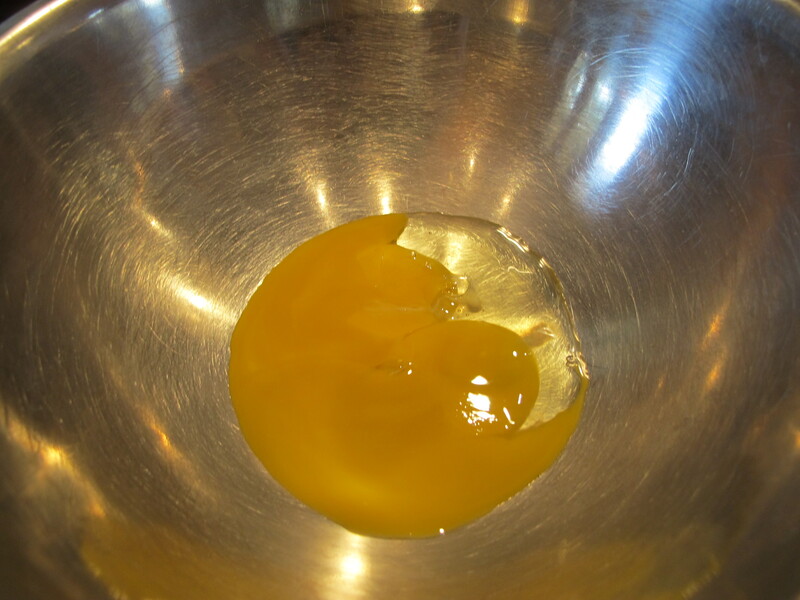 I’ve never made a paste of the eggs and cheese before, I will have to try that the next time I make carbonara. Snatching victory (and what a victory) from the jaws of defeat, Jo! 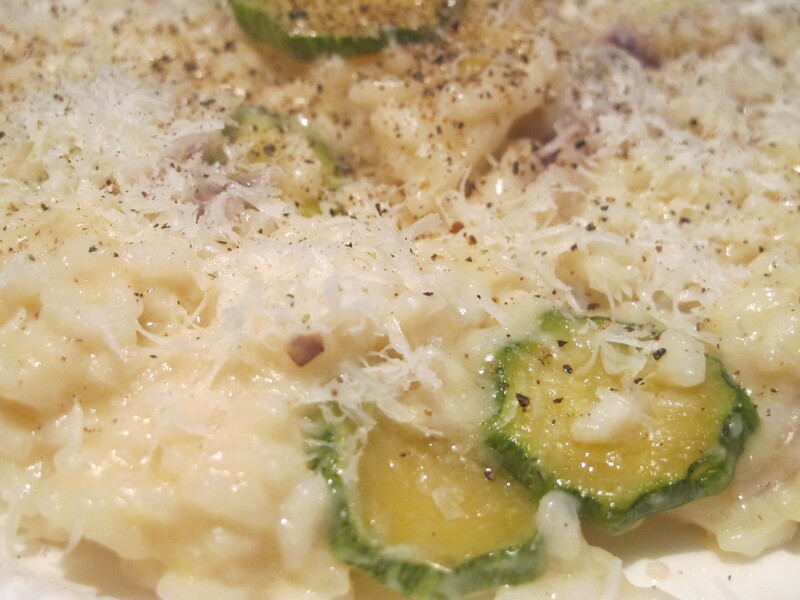 Love the courgettes in it too.